TV show dates: July 21, 2018 — present. Performers include: Amy Poehler, Nick Offerman, Simon Doonan, and Dayna Isom Johnson. 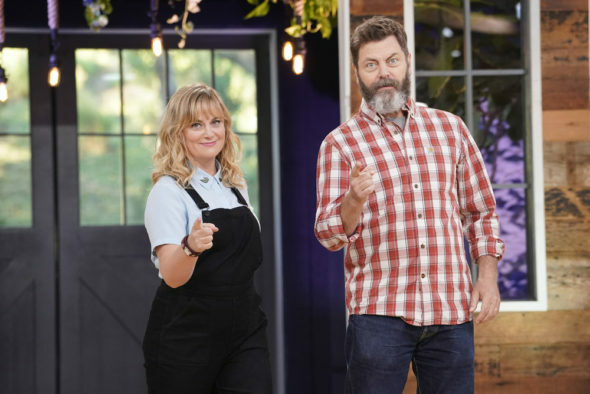 A crafting competition, the Making It TV show comes from executive producers Amy Poehler and Nick Offerman, who also host the reality TV series. It shines a spotlight on talented creators from across the US, who attempt to complete handmade projects in order to impress the hosts and judges Simon Doonan and Dayna Isom Johnson. Although Poehler is a relative crafting novice, she is an enthusiast. She and Offerman share a love of the handmade. In addition to being a writer and actor, Offerman is a professional boat builder and accomplished woodworker. Joining the friends and Parks and Recreation vets are Doonan, the Creative Ambassador for Barneys New York and Johnson, an Etsy trend expert. The friendly competition is set outside, and each episode features a central theme from a current trend in DIY and crafting. In every episode, the contestants will work on two projects meant to showcase their talents. The “Faster-Craft” round is a time challenge, which draws on the competitors’ creativity as well as their ability to work quickly. In the “Master Craft Collection” round, the makers are assigned a unique, themed challenge, which will require all of their expertise and innovation, as they vie for the title of “Master Maker” and a grand prize of $100,000. What do you think? Do you like the Making It TV series? Should this NBC TV show be cancelled or renewed for another season? More about: Making It, Making It: canceled or renewed?, Making It: ratings, NBC TV shows: canceled or renewed? I love this show I want to be on this show so bad. My imagination is ready for this how do I audition? Do I have to be installed famous, or have my parents get me the hook up? I am just a normal crafting addict. Loved this show! Can’t wait for next season. Dry humor abounds, combined with quirky creative innovation, mixed with interesting personality types. Loved it!!! loved it! Please continue it! the host and hostess were perfect. Continue it! Loads of fun! Very dull. Not exciting. Need to go thru steps on the contestants craft projects. Will not watch again.